Make your mark in the world with the freedom of adventure in the 2017 Toyota Highlander. This capable and luxurious vehicle features five doors and an available seating capacity for up to eight, ensuring that nothing is left behind. Available 2017 Toyota Highlander trim levels include the LE V6 FWD, LE V6 AWD, XLE V6 AWD and Limited V6 AWD. 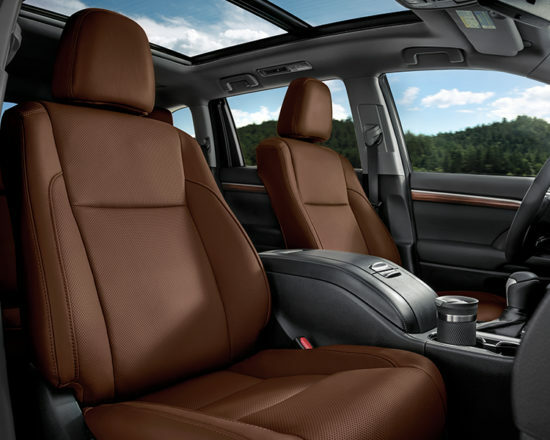 Complete with advanced detailing and contemporary refinements, the interior of the 2017 Toyota Highlander presents an opportunity for escape. Surrounding you is available silver accented interior trim as you benefit from the fabric, leather, or perforated and ventilated leather seat surfaces with heated front seats for when the weather gets cold. Customize your position through the available 8-way power adjustable driver seat while the available 3-Zone Independent Automatic Climate Control ensures that satisfaction as it maintains different temperatures throughout the cabin at the same time. Keep your hands placed on the leather-wrapped and heated steering wheel as the mounted audio controls deliver access to your settings without distracting you from the road. Spacious seating and plenty of cargo space are offered as you engage with the 60/40-split middle bench and 3rd row. Elegance is promoted through the sophisticated exterior design of the 2017 Toyota Highlander as you enjoy a new front and rear fascia design with a sport grille and rear spoiler. Clear up your view in no time through the front windshield de-icer as you enjoy the increased awareness of the side-view mirrors. Easily load your cargo with the help of the remote-operated power rear door with jam protection, which includes a flip up rear door glass with sunshade. Brighten up any driving situation through the projector style halogen headlamps, fog lamps and LED rear taillamps for an enhanced visibility on the road in variable conditions. 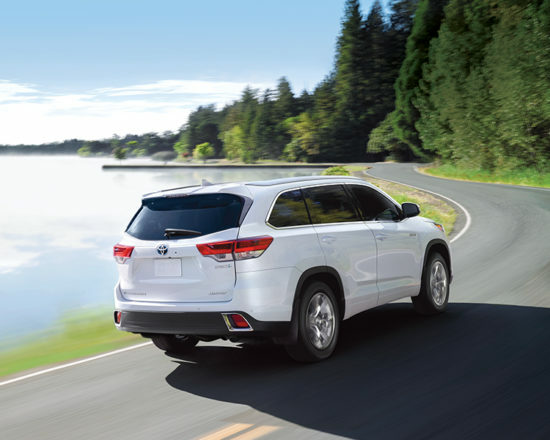 Make the most of each connection in the 2017 Toyota Highlander as you embrace the available Display Audio System with a 6.1- or 8-inch display screen. Through Bluetooth Capability and advanced Voice Recognition, you can access your compatible devices for hands-free calling, messaging, music search and more, without compromising your safety. Entertainment is offered with the integrated SiriusXM Satellite Radio System and its 120 commercial-free channels. Through features such as Driver EasySpeak, you are offered an integrated microphone that can transmit audio through the rear speakers so simplifying the process of gaining the attention of rear passengers. Refresh your experiences in the 2017 Toyota Highlander as you select from an array of available Genuine Toyota Parts & Accessories. With the available cargo liner, you are offered rear protection no matter which 3rd-row configuration you are utilizing. For cold winter days, benefit from the plug-in block heater for access to easy engine start and quicker vehicle warm ups. Open the door to new possibilities in the 2017 Toyota Highlander as you experience the smooth and refined power of this capable SUV. Precision handling is delivered through the available 8-speed automatic transmission as you engage with excellent response. Take advantage of the Highlander’s available All-Wheel Drive System and a towing capacity of up to 2,268 kg (5000 lb.). Available Stop and Start Engine technology deliver increased efficiency as it stops the engine every time the vehicle comes to a full stop and seamlessly restarts it as the brake pedal is released. The 2017 Toyota Highlander is prepared to take you and your family further than you ever thought possible. 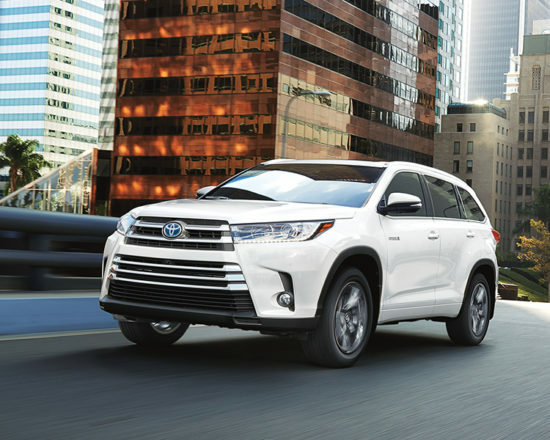 Practicality, luxury and capability mean it’s all in the details for the new Toyota Highlander. Experience all this SUV has to offer with a test drive! Check out the 2017 Toyota Highlander at your local Edmonton Toyota Dealer – Gateway Toyota! Our inventory of 2017 Toyota models and pre-owned vehicles is second to none at Gateway Toyota! Come find out why we are the premier destination for purchasing or leasing a new Toyota car, SUV or truck!